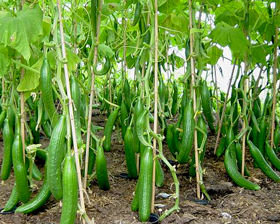 A vigorous plant habit, Cucumber Zozulia produces many long, dark green skinned, slightly ribbed, bitter free fruits 20-25cm long, throughout the season. Its vigorous habit makes it ideal for growing in an unheated glasshouse, but is equally at home in a heated one for a very early crop. Sow seeds singly from late winter onwards 1cm deep in 7.5cm pots of moist compost. Germination usually takes 7-10 days at 24-27C.